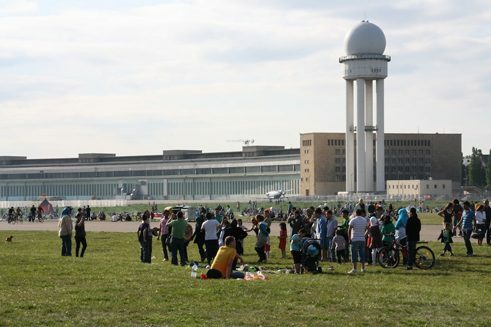 A 380-hectare open space in the midst of a major city: since Tempelhof Airport ceased operations in 2008, the grounds have evolved into Berlin’s largest city park. Where once aircraft taxied to their starting positions, today joggers and cyclists make their rounds. Baseball players do warming-up throws, strollers enjoy the wide view and urban gardeners relax amidst potatoes and sunflowers. After the closure of the airport, the Berlin Senate had planned to build thousands of flats and a new main library on the Tempelhofer Feld. But Berlin’s citizens resoundingly rejected the plans in a referendum. In May 2014 a majority decided in favour of the initiative “100 Prozent Tempelhofer Feld,” which precludes construction on the former airfield. Now, until the end of 2015, a development and management plan is being prepared with public participation. Tilmann Heuser, regional director of the Bund für Umwelt und Naturschutz (BUND), has been appointed by the Berlin Senate with the coordination of this process. At information events, thematic workshops and field dialogues, anyone who wanted to could contribute ideas and wishes. Tempelhofer Feld | Photo: Tempelhof Projekt GmbH Tilmann Heuser summarises the results: “Berliners want to change the Tempelhofer Feld as little as possible and preserve the uniqueness of this open space.” Spaces for possibilities instead of pre-specified uses, freedom and spaciousness instead of parcelled-out recreational facilities: according to the wishes of the city’s residents, everything should stay the way it is, with the exception of improvements such as more toilets, benches and drinking fountains. 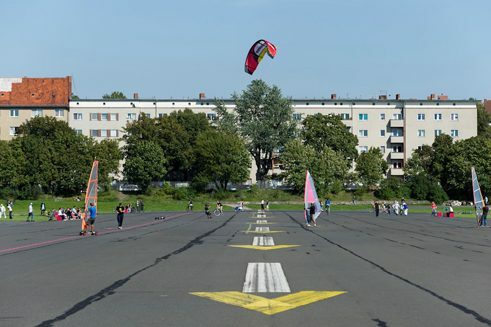 “The Tempelhofer Feld is a non-commercial space that is open to everyone and enables movement, encounter and communication,” says Tilmann Heuser. The appreciation shown this location reveals an understanding of urban development that encompasses more than defining surfaces and determining utilisations.” As an urban space in the process of transformation, the Tempelhofer Feld makes clear the significance of open surfaces and open spaces in the city.” In other words: Urbanism is more than buildings and concrete. Airport terminal | Photo: Tempelhof Projekt GmbH The passion with which many Berliners discuss the future of the Tempelhofer Feld also has to do with the complex past of the location. Whether sports, aviation, the Third Reich or Cold War, the traces left by the 19th and 20th centuries have made the grounds into a site steeped in history. As early as 1883, football and cricket players were pursuing their balls. In 1909, aviation pioneers Ferdinand Graf von Zeppelin and Orville Wright thrilled Berliners with their inventions. And in 1923 the airport was opened that Hitler, for purposes of propaganda, had expanded into a “Weltflughafen Tempelhof.” The SS set up the concentration camp Columbia on the grounds. During the Second World War, the armaments industry used the grounds and exploited several thousand people as forced labourers. With the Berlin Airlift of 1948/49, the Western Allies launched the Tempelhof myth and turned the airport into an internationally profiled symbol of the defence of freedom. After the Soviets had blockaded all entries by water and land to the island of West Berlin, the British and Americans supplied the city from the air and thus secured its survival. Airport terminal with radar station | Photo: Tempelhof Projekt GmbH Plans for the future also exist for the landmarked, 300,000m² airport terminal adjoining the Tempelhofer Feld. The hall is leased out for festivals, trade fairs and concerts, refugees are living in one of the seven hangars. The Berlin Senate is planning to open a walkable gallery of history on the building’s 1.3 km-long roof. Even more spectacular is the proposal by architect Arno Brandlhuber. To relieve the housing shortage, he would like to add eight storeys to the building as a whole. In this way, 3,500 flats would be made available, the same number that were originally planned for the Tempelhofer Feld. Preserving space and building flats: both would be possible. 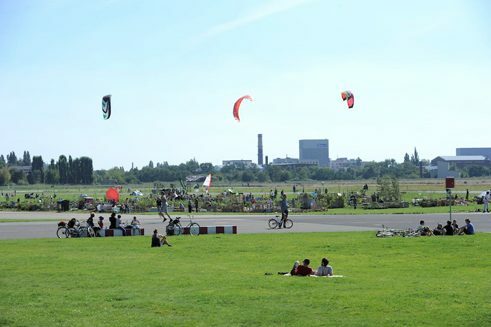 Perhaps the Tempelhofer Feld is a place where pioneering spirits and uncommon ideas can flourish and prosper especially well. Elisabeth Schwiontek is a free lance journalist in Berlin.